Investigators believe Marc St. Arromand’s motorcycle may have struck debris on the pavement before the crash, a police spokesman said. An off-duty NYPD officer was killed Thursday when he lost control of his motorcycle and crashed on a busy parkway in Queens. 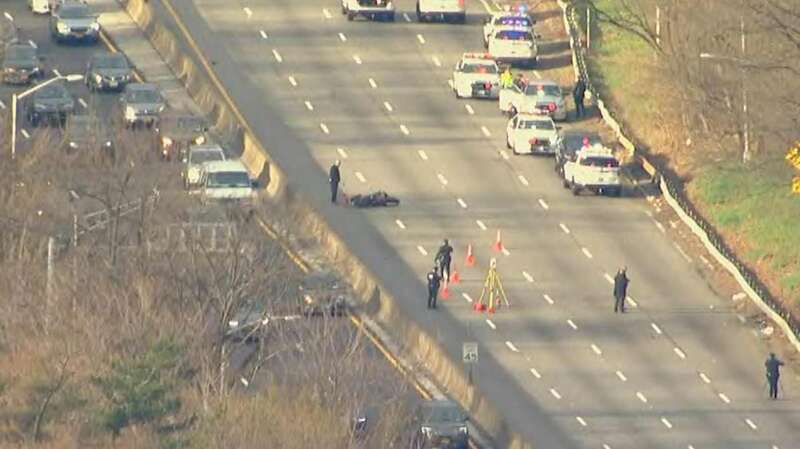 Marc St. Arromand, 42, was traveling south on Laurelton Parkway, between Linden and Merrick boulevards, when he was thrown from his 2011 Yamaha motorcycle around 5:28 a.m., the NYPD said. He hit a metal guard rail and fell to the roadway, where he was struck by a 2017 gray Chevrolet Camaro, police said. The 53-year-old Camaro driver remained at the scene. St. Arromand was rushed to Franklin General Medical Center in Valley Stream but doctors were unable to save him. Investigators believe St. Arromand’s motorcycle may have struck debris on the pavement before the crash, a police spokesman said. He was wearing a helmet and his face visor was in the proper position when he crashed, the spokesman said. The 14-year veteran of the department worked with the NYPD's Highway Unit No. 2, which patrols roadways in Brooklyn and is based at a central location on Flatbush Avenue, according to police. He was on his way to work when the crash occurred. The crash caused major morning rush hour backups on the parkway, which merges with the Belt Parkway just south of the crash, as well as on the Southern State Parkway, officials said. Funeral arrangements for St. Arromand, who was from Haiti, were pending but are expected to include full honors due an active duty officer, officials said.